I, Dave Conroy, the master of the fast but excellent tasting recipe, have developed a speedy, easy, no- equipment- necessary recipe for fantastic icecream. OK, it’s not super healthy, but it is home made, you know every single good ingredient (3) that’s in it because you put them there and its 100% natural. Go to the supermarket on the way home from work. Buy 1 can of condensed milk and 1 carton of cream and 6 passionfruit. Stir the cream and condensed milk together in a saucepan over a low heat. Add the insides of the 6 passionfruit and let it sit off the heat while you open a beer, watch the news, have a shower or water the garden. Then, (and this is the good bit) raid the grog cupboard, find some vodka. Any other liquor will do, but vodka is good because it has no flavor or colour. Gin will work just as well. Anything that won’t mask the flavor of the passionfruit. Add a good slug, around two tablespoons. Stir. Put the lot in a plastic container and stick it in the freezer. It’ll be ready in about an hour. This wondrous creation has been tried and tested in the The Lone Drainer Test Kitchen many times. There is science at the back of it too. The alcohol in the vodka stops the icecream forming crystals, which make for an unpleasant texture. Alcohol just won’t freeze in a normal domestic freezer. So it keeps the ice cream creamy. Ipso facto, you don’t have to do all that churning with machines and gadgets and what not. We’ve tried it with whisky and two espresso coffees instead of the passionfruit and that came out tops too. It’s just not a fussy recipe. But it won’t work without the grog. Trust me. I’m a plumber. And I don’t like to waste good alcohol. 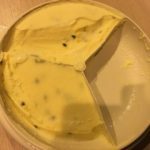 Here is a picture of two thirds of my last batch of passionfruit icecream. I did want to photograph it BEFORE eating it, but just couldn’t resist. Evidence of how good it is. Read our blog. Cook my food. Admire our plumbing. Inventor rolls out 100 years. How much to fix my toilet? How do tree roots get into pipes? Do tree roots grow in PVC pipes?